What Makes Eleotin® More Expensive than Most Other Health Foods? Eleotin® is more expensive than most herbal products if we compare monthly consumption costs. But the price of Eleotin® has actually reached quite competitive levels. Eleotin® used to be much more expensive in the past. Incentives and discounts are now available when users purchase multiple month supplies. It used to be difficult to obtain the herbs of Eleotin® that met our high quality standards. In the fall of 1998, the maximum amount of Eleotin® that could be produced was about 4,000 units. This is no longer the case. Eleotin® can now be produced in much larger quantities, and still maintain its high standards in quality. 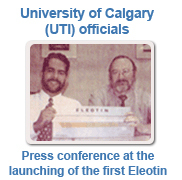 Developing and testing Eleotin® took many years, and is ongoing today. Academic institutes such as Yale University, Cambridge University, and the University of Calgary supported research activities. As of 2003, most of this research had been completed. Eleotin®s raw materials are tested to ensure they are not contaminated with unsafe levels of heavy metals, herbicides and pesticides. Contamination and pollution by these toxic materials should be a constant concern for every herbal producer, which sadly, is not necessarily the case. There is a conscious concern about safety because Eleotin® is for long-term consumption. Also, uniformity is always a huge concern. Often, expensive herbs have to be discarded—not because of any defects but because they are different from those used in previous batches. Lastly, but probably most importantly, we should compare the cost of Eleotin® with its benefits. In the U.S., the direct and indirect cost for diabetic care is $245 billion a year. Americans with diagnosed diabetes incur average medical expenditures of about $13,700 per year, of which about $7,900 is attributed to diabetes. The benefits of Eleotin® far outweigh what you have to pay. In fact, Eleotin® is a lot cheaper than what some North Americans spend on their daily specialty coffee. No worries, no damage is done. You can stop safely at any time. The long term health benefits received up to that point are not lost. For example, the regenerated ß (beta) cells or insulin receptors are not immediately lost. Eleotin® is not like other drugs, which once stopped, they develop some resistance so that you have to take a lot more the second time around. Eleotin® is known to have no such development of resistance during and after usage. Please be patient. For example, an uncle of Dr. Kim had to use Eleotin® for 6 months before experiencing any effects. The uncle complained a lot. But after the sixth month, all the beneficial effects emerged suddenly. He could go on to stop insulin injections and other oral hypoglycemic agents. The second reason is that people begin to feel great within the first month or two, and believe this is a sign that they should stop taking Eleotin®. This is very wrong. This is only a sign that Eleotin® has started to work. People should continue to take Eleotin® for at least 4 to 6 months after they begin to experience the benefits. For example, if a patient begins to experience the effects after two months of usage, he should continue to take Eleotin® for another four months, for six months in total. What If I Take Too Much or Too Little Eleotin®? Taking a lot of Eleotin®. In experiments, rats were given fifty times the human dosage for seven months. No side effects were detected and no damage was done to any organs. As mentioned in the last question, if your body can take it, Eleotin® is quite safe to use in large amounts. However, please be aware that more quantity does not necessarily mean better or quicker results. This will depend on your body. Dont increase the amount unnecessarily because you could be wasting the product. Here, Eleotin® simply does not to start to work. There should be a minimum concentration in the blood for the benefits of Eleotin® to kick in. What is the Minimum I should Take? On average, if you make 3 to 4 servings out of each pouch and take it a total of 3 times (1 Blend A, 1 Blend B, and 1 Blend C) a day, you will be above the minimum threshold. At that time, you should eat the sediments too. Many people do experience the benefits at even smaller quantities. However, it is recommended that patients start with small quantities and increase the consumption to the recommended dosage of 3-5 drinks per day (2 Blend A, 2 Blend B, and 1 Blend C). Even if you have taken too little of Eleotin® to experience the effects, nothing harmful that has happened to you. Eleotin® is a safe food. You just do not obtain the desired effect. How Much Eleotin® Should I Take? The average person should take between three to five drinks of Eleotin® each day. Drinks should use between a quarter of a pouch (2 gram) to 1/2 of a pouch (4 grams). However, there are some points to consider when taking Eleotin®. Everyone new to Eleotin® should start off slowly. They should take three drinks a day, with each drink being two grams or less of Eleotin®. The first of these three drinks would be Blend A, the second Blend B, and the third Blend C. It is especially you start with a small amount if your stomach gets easily upset, it is important that you take a smaller amount at the beginning. You can gradually increase the intake amount, and also the number of daily drinks. The fiber content may also upset your stomach. You can try straining the tea, and completely remove the sediments. You may try the capsule form. Individuals with severely impaired kidney or liver function can start with a very small dosage: 1 gram or even less per drink. They may also refrain from making a tea and just directly take the powder directly in very small quantities. The additional water intake from drinking the tea form of Eleotin® burden someone with weak urination capabilities. However, many such individual saw their kidney and liver functions improve after using Eleotin® for a long time. It is believed that Eleotin® is safe for pregnant women because it does not contain any toxic substances. However this has NOT been proven by clinical tests and it is STRONGLY recommended that you consult your physician before taking Eleotin® while pregnant. In principle, pregnant women should not take any strong or intrusive substances whether it is natural or chemical. In South East Asia, pregnant women are advised not to eat fruits such as pineapples because of its high level of acidity. If you are pregnant, do not use Eleotin® prior to a discussion with your physician. But when a pregnant woman needs to take drugs to control her blood glucose levels, Eleotin® could be a safer choice. The best thing to do is to do is let your body decide how much you should take. Those used to taking herbs are familiar with this practice. Ideally, a person should be “tuned into” his body and be able to gauge how his body is reacting to Eleotin®. For example, some people feel their bodies can take in more herbs and want to feel more immediate results. They increase the Eleotin® consumption amount and frequency. This is still very safe but it may be difficult to drink. Again, there is no problem with this if the individual listens to his/her body. If they began to feel any discomfort, they should reduce the consumption quantity appropriately. After time, people will hopefully adjust their intake as they learn to let their body decide. It is best to start with smaller quantities and see what happens. A bottle of capsules contains a 1 month supply (30 capsules). Depending on the formula and the country, a month’s supply for your regimen may have different numbers of bottles. Eleotin® Gold Capsule comes in three bottles: Morning, Afternoon, and Night. take one capsule from each bottle every day: 1 in the morning, 1 in the afternoon, and 1 at night. Each capsule is clearly distinguishable from the other capsules because each of them has different colors. Eleotin® capsule form was created simply for its convenience. However, for people who need to have flexibility in their dosage amount, they may still want to use the traditional tea form. Pour 1 pouch of the powder into an herb-brewing pot with 2.5 cups or 360 ml of water. Brew the mix and stir occasionally for one to two hours on low heat until the water is reduced to half. If the mixture is boiled at too high of a temperature, the taste may be bitter and the effect may be decreased. Drink 1 portion at a time and store the remainder of the tea in the refrigerator. Each pouch will make between 2 to 4 drinks. The amount consumed at one time can be gradually increased as you become more accustomed to the flavor of the tea. You can collect and refrigerate the left over sediment for a second brew. It is a great waste to throw it away after just one brew. It is recommended that the sediments be taken together with the tea, or used to create a second drink. Dont throw away the sediments after 1 brew, they are still very beneficial. Microwave Method – Another way to prepare Eleotin® is to use a microwave oven. Simply put the Eleotin® powder in a container with 1 to 2 cups of water and heat for 10 to 20 minutes on low heat. Do not bring to a boil. Thermos Method – You can also put Eleotin® powder in a thermos with hot water, shake, and let it steep for 25 to 40 minutes. This is the simplest method and it produces very good results. Direct Consumption – You can even eat Eleotin®, too. In that case, the absorption and effectiveness can be slower. Some users have started to put the sediment directly into their food, soups especially. This seems to be a good way to counteract some of the inconvenience associated with taking Eleotin®. What About the Sediments at the Bottom of the Class? You can eat the sediments, reuse them sediments for another drink, or sprinkle them on food. This is very important since 75% of the ingredients of Eleotin® are still in the sediments after the first brew. Dont waste this fantastic product. All of the beneficial ingredients of this product are locked in Eleotin®s powder. Through the various preparation methods, these active ingredients are released. The best way to release the active ingredients is to brew over low heat. But the other convenient methods are still beneficial. There is always a certain amount of active ingredients left in the powder after it is brewed, so it is better to consume the powder or reuse them for another drink. Alternatively, you can sprinkle the sediments on your favorite dish while cooking. Can I Put Sugar or Sweeteners in Eleotin®? You probably know the answer already. Sugar and sweeteners are not healthy. So the answer is “no.” To experience the full benefits of Eleotin®, you should consume it without sweeteners or sugar. If you do not like the taste, you can reduce the amount you brew until you get used to the taste. Most European and Asian users have no problem with the taste of Eleotin® but just start slow if you’re not used to herbal products. Please remember that Eleotin® is a natural herbal tea drink made from roots and leaves. It is not supposed to taste like a soft drink. Don’t worry, you’ll soon get used to it. Will Freezing Eleotin® Hurt Its Effectiveness? There is no need to freeze Eleotin®. Eleotin® in its dried powder form should be stored at room temperature in a dry place. It will remain fresh and effective for about 2 years under these conditions. Please store it just like any other tea product in your house. If you wish, you can put Eleotin® in the fridge, but there is no need to put it in the freezer. It is not really disastrous if you freeze Eleotin®. However, freezing may destroy some of Eleotin®’s ingredients. Instead, once Eleotin® is prepared, it’s better to drink it immediately or store it in a closed container in your refrigerator. If you want to make a large batch of Eleotin® to drink, try to make enough to last about a week and then store it in the refrigerator.